With family drama in the forefront this week, there’s plenty happening with all the major characters on Grey’s Anatomy. Thankfully, it’s not all dramatics, which gives some wiggle room for a few moments of laughter. It is about time that a lot of these issues are being hashed out because some of them have been dangling over the season like a guillotine waiting to fall. Plus, these stories pave the way for greater character arcs in the remaining back half of the season. The core of the episode is family drama, and there is plenty of it to go around. The Webber-Avery family seems to have the biggest issues at the moment and throughout the episode. The episode opens with Jackson and Maggie making out in a supply closet, only to be caught by their smiling parents. Catherine’s face is way more shocked than Richard’s, but both of their expressions are downright hilarious. Catherine appears to be the only person impacted by her son and step-daughter dating, but her reasoning is a bit selfish. She feels that if things end badly between Jackson and Maggie, it will affect her marriage with Richard. This hidden conflict almost ruins the family’s planned groundbreaking surgery on Michelle for the Surgical Innovation Contest. Thankfully, they get their business in order and manage to pull off the surgery. It’s too bad that we weren’t privy to the results in this episode, but it seems that they are the first team to actually make solid progress in terms of the contest. It might not seem as jarringly obvious, but the storyline with Arizona and Sofia is just as important as the Webber-Avery conflict. Sofia starts the episode being a bit sad, mainly because she doesn’t like being alone in Seattle without her friends or Callie. Arizona is upset that she hasn’t been able to spend as much time with Sofia as she would like, so she brings Sofia to work with her. After a stressful storyline that includes a mother with complications during her second pregnancy and Amelia and Alex diagnosing her young boy with seizures caused by a benign brain tumor, it was clear that Arizona’s current job is taking a huge toll on her. Being able to even spend a little time with Sofia seemed like a relief for Arizona, and her small crying session at the end of the episode pretty much confirms the way in which she will be leaving the show. Arizona can’t stand being away from Sofia and also wants to make her as happy as possible. The only feasible solution is for Arizona to move out to New York to be close to Callie and Sofia. The framework has been laid, and I can’t imagine any other scenario in which Arizona leaves. Family drama also gets unexpectedly real throughout the course of Owen’s trauma certification exercises for the interns. April finds out and forces her way in to help “train” the interns. Instead of helping, April makes the day a living hell for them by creating unrealistic scenarios and randomly killing off their dummies whenever she felt like it. The whole thing turns into a dictatorship with April at the helm, causing Owen to keep fleeing the scene. This is also the comedic relief of the episode, and it really works well. Owen and Amelia are still sleeping with each other and decide that they are happy with their no-strings-attached relationship. However once they say it aloud, all they can do is focus on emotions. Owen keeps running off from the trauma certification to deal with his issues with Amelia, mostly the whole Teddy thing since Amelia randomly brought it up. These two still have a lot of issues to resolve because Amelia keeps blaming the tumor for everything and Owen can’t get past his own feelings. They either need to make up or never talk to each other again because their antics are getting a little old. At the end, Owen gets in a cab to go to the airport, presumably to go see Teddy, so maybe we will get some answers on where he is at emotionally soon. Back to the training, April goes so crazy that one of the interns points out how much she is acting out. That causes April to totally lose it and have a breakdown in front of everyone. April is spiraling very fast and is almost at the point of being a danger to herself. Jackson sees her wandering around the hospital’s halls looking half-crazed and tries to calm her down. But April is so out of control that she kisses Jackson because she clearly never got over him. Jackson pushes her away and doesn’t allow it to go any further because he is a classy guy and respects Maggie. April needs some serious help, and I really hope that someone forces her to get some before she goes too far. 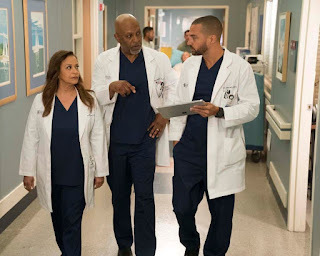 The nicest moment of the episode is when Bailey learns that the patient she is treating with Jo is a former astronaut and one of her childhood idols. The patient is being treated for crush wounds, and she appears to be a little off when talking about her time travel theories. Being the nerds that they are, Maggie and Bailey are elated to be talking about wormholes and time travel — much to Jo’s dismay — when they are all in the operating room together. While the surgery wasn’t successful, two good things did come from the astronaut’s death. 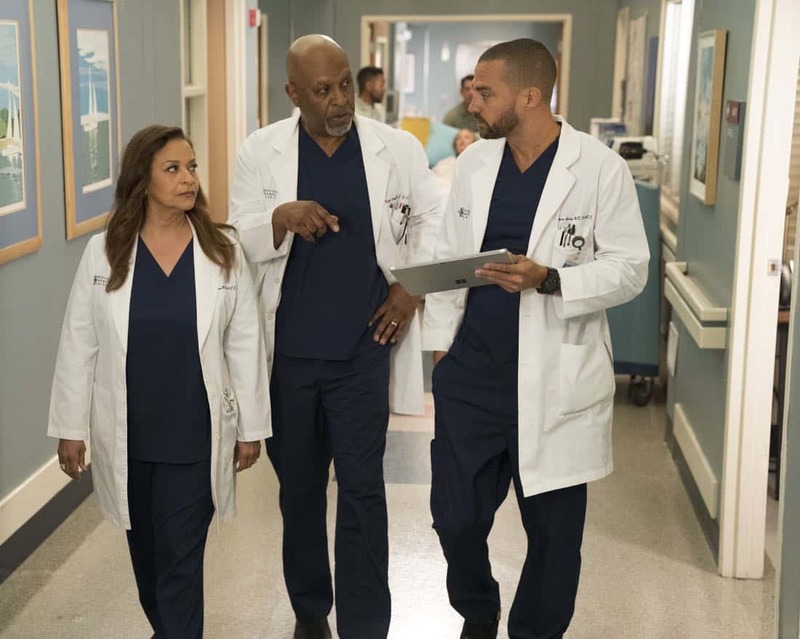 First, Jo suggests that Bailey name her colonoscopy device for the Surgical Innovation Contest after her fallen idol, and Bailey decides to call it The Trailblazer. Second, Jo and Maggie get inspiration during the surgery to convince Meredith not to throw in the towel on her Surgical Innovation Contest project. Maggie feels that Ellis probably did cut Marie out of their shared work, so Jo tells Meredith that she can’t let what her mom did affect what they are working on now. Jo’s plea to continue is enough to get Meredith fired up again about their project, so the search for a new polymer is on. While there may be more Ellis and Marie drama to be dug up soon, at least Maggie, Jo, and Meredith seem to be coming to terms with everything involved.